While staying at the Ritz Carlton in West Maui, we temporarily needed to escape the wind and rain of Kapalua. My hair just couldn’t take it anymore. 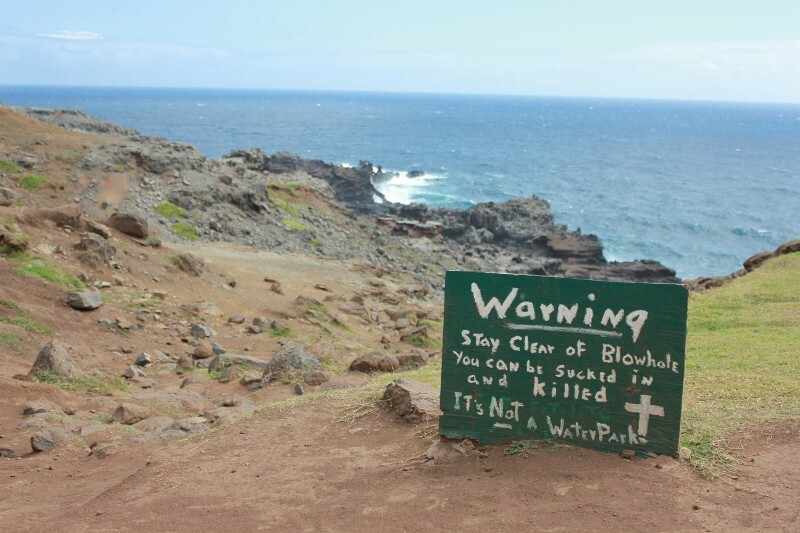 Typically, we would flee by heading South to dine at a favorite restaurant in Lahaina, but today we decided to travel North towards the Nakalele Blowhole. 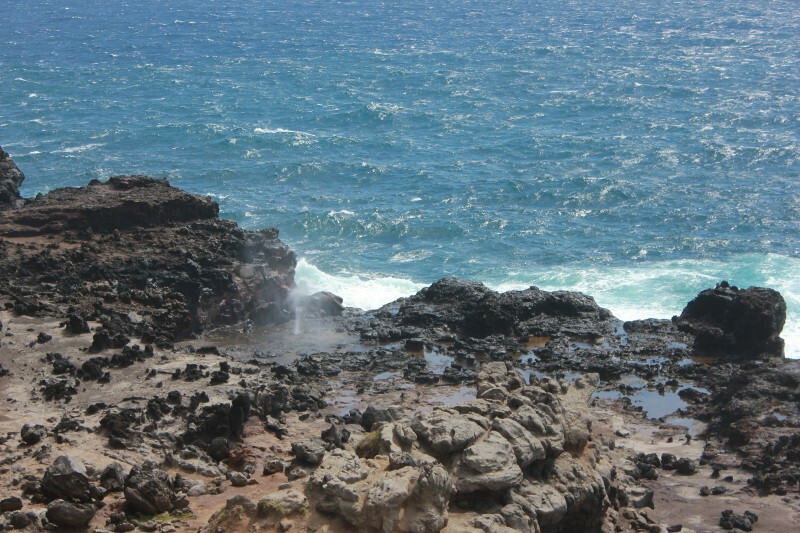 The Nakalele Blowhole, on the Northern end of Maui, spouts water up to 100 feet. And comes with a warning. 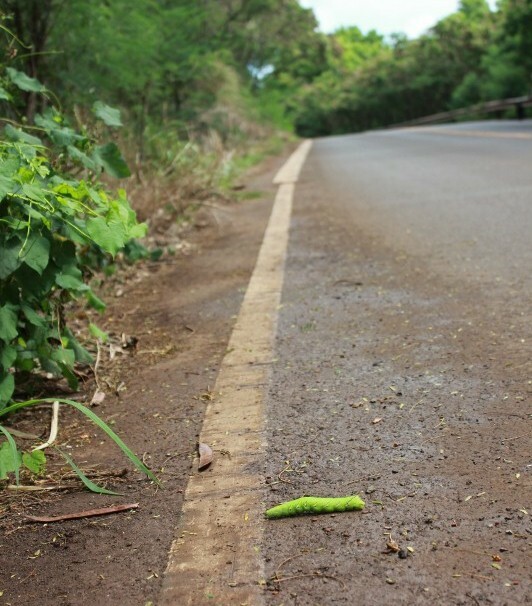 Peter and I headed towards the blowhole at the speed of this GINORMOUS caterpillar we saw along the way, slowly and cautiously, wanting to get to our destination without jeopardy and savoring the sights along the way. 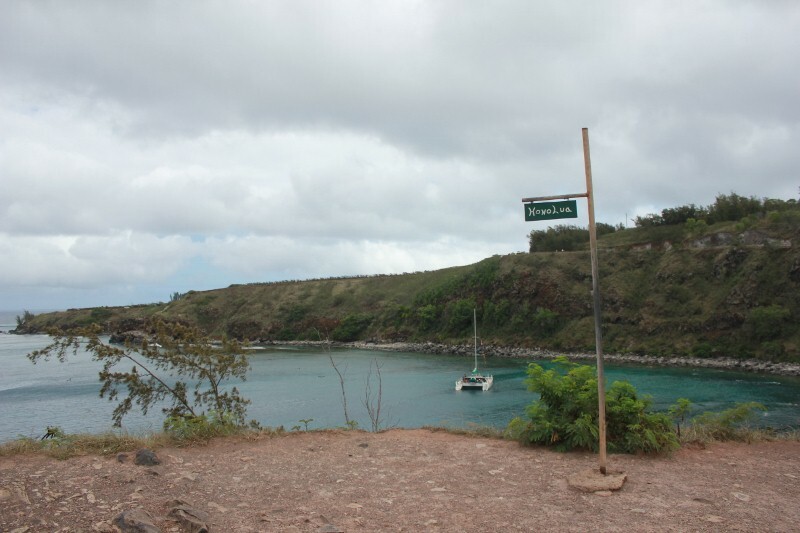 We made a pit stop at Honolua Bay, known to be a snorkeling sanctuary. And judging by the floating, plastic mask bearing bodies in abundance, this was true. Though this was a contender for my Maui snorkeling experience, I opted for the kayak & sea turtle snorkeling tour in Olowalu instead. No regrets. 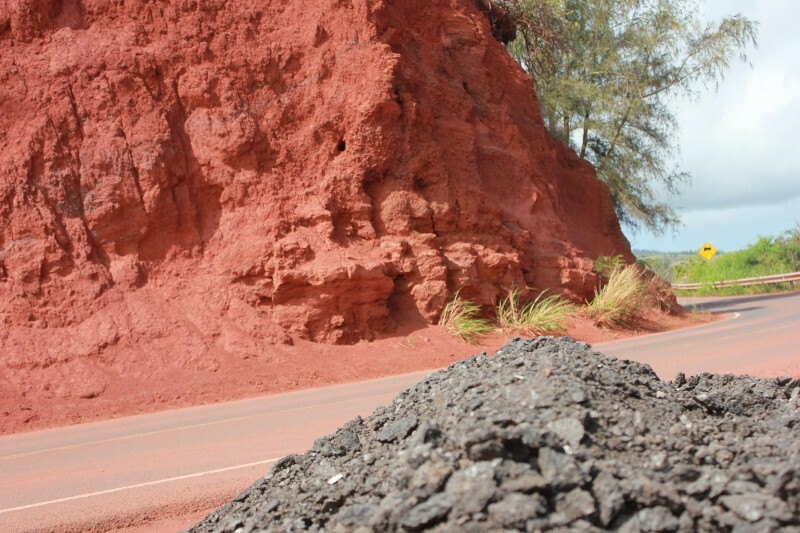 Continuing our trek past the red rock and super green foliage, I saw something that made me order Peter to halt the car. And he did. Don’t you love it when they listen? What I saw confused me. 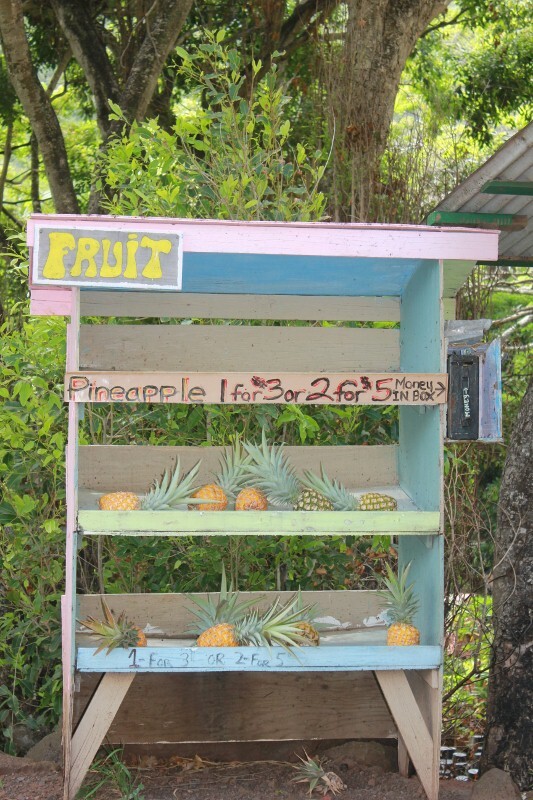 Not that there was a fruit stand on the side of the road, but that the goods were being sold strictly by the honor system. It conjured up a slew of questions. Does anyone steal pineapples? Or the money? Who stocks the fruit? Is that fruit from the pineapple farm I toured the day before or the grocery store? I may never know the answers. Might as well move on. We finally made our way to the blowhole and easily found parking. Our first warning came immediately, a few steps from the parking lot. “Park and Walk at your own Risk”. Okay, I’ll be careful. 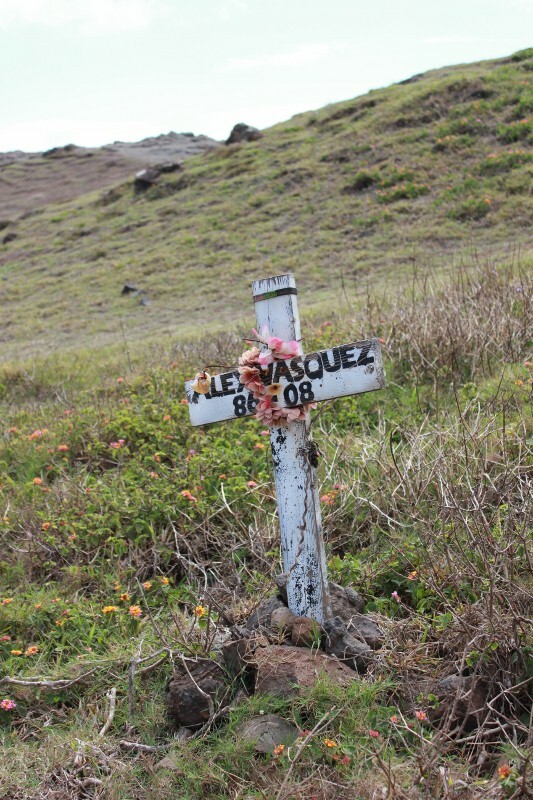 Then we saw a cross indicating a death and it made me think that I should have taken the first sign more seriously. We tentatively began the challenging hike down. Why did I wear flip flops? Bad idea. Really bad. 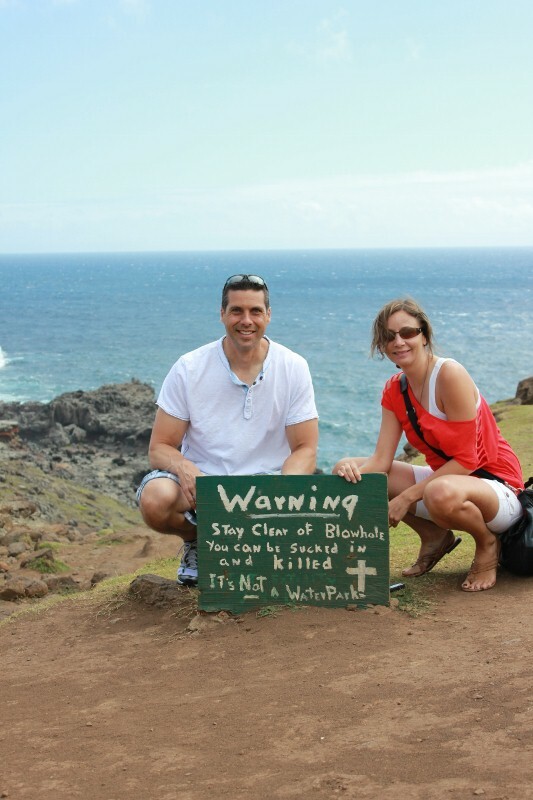 It may have been the warnings or the terrible choice in footwear that kept me from getting too close to the blowhole. Even at a safe distance the geyser-like water made a stunning display. Though is was quite a bit different from the La Bufadora blowhole in Mexico. This one scared me. It looks innocent enough from this far away. DO NOT get close to the blow hole and look inside, you could get sucked it. Don’t believe? Read this article about a Blowhole Victim. 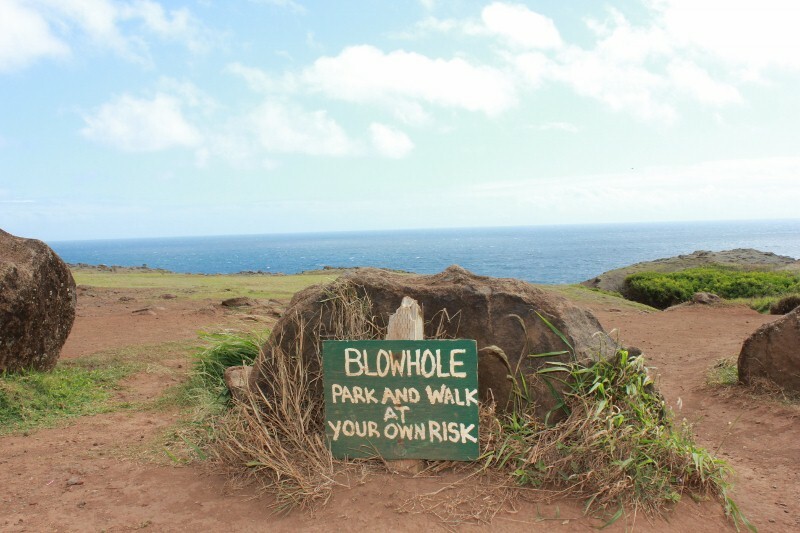 How close would you have gotten to the blowhole? 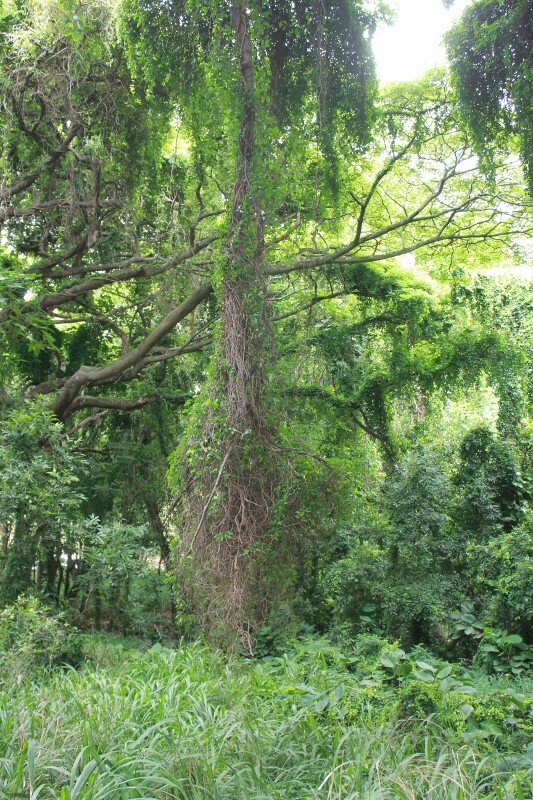 Have you driven the road North of Kapalua? Thanks for a nice warning to us….Its really help a lot specially those who are new in this place..
Next time, I probably would have gotten a few feet closer, but not close enough to feel the spray of the water! There is a sign now, right before you hike down. But, I didn’t see anything as you got closer. It is dangerous, but absolutely worth visiting if you are careful. I am a new Maui transplant and just drove the road north of Kapalua last week…what a stunning show! The cliffs, the winding, narrow roads, the stopoffs, fruit stands…everything! It's an amazing place! Maui no ka oi! Amen Fred. The world thinks Americans are stupid not because we have jackasses like this idiot. They think we are stupid because we sue others because we don’t take responsibility for our own actions. This retard didn’t respect the obvious danger the blow hole hole exhibits and fell in. Then the family blamed the State of Hawaii because they didn’t rear a child that could make an intelligent decision. It’s really too bad he didn’t just get really hurt and would have been given the chance to learn from his behavior.